The leading global electronics company, Hitachi has announced the launch of its next-generation Blu-ray Disc Hybrid Camcorder – Hitachi DZ-BD10HA, which able to capture rich and vibrant videos and stills in Full HD (1920 x 1080) resolution, recording HD video onto three different formats including Blu-ray Disc, HDD and SDHC. Three Format Hybrid Compatibility – This camcorder has the versatility of being able to record HD video onto 3 separate formats (Blu-ray Disc, Hard Disk Drive, SDHC) and provides the flexibility and ease of playback and long recording time all in one camcorder. 7 Megapixel CMOS Image Sensor – The CMOS image sensor in this camcorder is designed to record the highest resolution video with effective 4.67 mega pixels while minimizing distortion and artifacts to ensure the most clear and vibrant high definition picture. The camcorder is also capable of capturing 6.22 mega pixel stills onto an optional SD or SDHC card. One-Touch Dubbing – With the push of one button the user can transfer HD video from the SDHC card or hard drive to a Blu-ray disc all within the camcorder; this eliminates the need to turn on a computer. Face Detection – This feature automatically detects and focuses on the face to provide true-to-life color accuracy and sharp picture quality to the user. O.I.S. (Optical Image Stabilization) – O.I.S. automatically detects and cancels camera shake by accurately stabilizing the lens to produce the most sharp and vibrant picture possible. 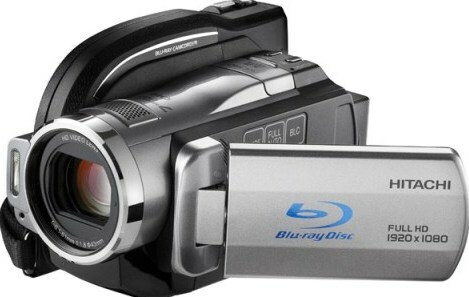 The new Hitachi DZ-BD10HA Three Format Hybrid Blu-ray Disc Camcorder with integrated 30GB HDD (records up to 4 hours 20 minutes of 1920×1080 HD video) is expected to be available by September 2008 for $999.